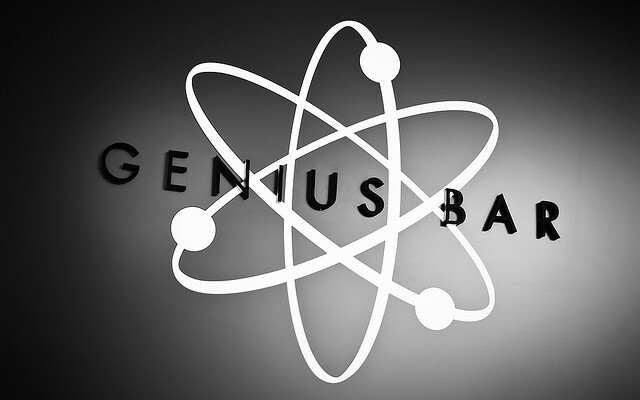 Apple’s Garden State Plaza retail store will be getting a first-of-its-kind enhancement in the form of a double-row Genius Bar that should help the iPhone maker meet the growing demand for technical support from its customers, ifoAppleStore reports. The Cupertino, California company has been steadily improving its Genius Bar workflow, and the new layout is a significant leap forward. “Tipsters say the store will move two spaces away to the former Charlotte Russe store, nearly tripling the store’s square-footage. Inside, there will be two Genius Bars parallel to the rear wall, one behind the other, allowing 360-degree access,” the report noted. Double Genius Bar, it’s so beautiful. The new design will also feature a rear wall with storage drawers for tools and other equipment. According to ifoAppleStore, Apple first tried out a “floating” Genius Bar at its Los Gatos store before testing a longer bar at its Bellevue Square location (pictured below). Apple has calling more attention to its Genius services. In July, the company kicked off a TV campaign starring one a Genius technician, but the ads were poorly received and have since fizzled out. It has also been rolling out Genius support on its online store, though the service is currently only available in a few countries. The more than 375 Apple Stores worldwide have hosted over 300 million visitors so far this year, with an average of 50,000 genius bar visits per day. Eyes are on Apple this week as it is set to announce its sixth-generation iPhone at a media event on Wednesday.